What Could Be More Romantic Than a Clean Home? This Valentine’s Day, you may have a few things planned. Whether you’re going out for a romantic dinner, packing your bags for a romantic getaway, or cozying up indoors for a lowkey movie night, you’re probably planning for a day full of love. This holiday is the perfect time to focus on the things that matter most to you: your loved ones… OK, and maybe a giant chocolate and peanut butter heart, too, of course. And we’re not just talking about your significant other here, either! Friends, nieces and nephews, yourself — Valentine’s Day is about showing the love to all of the most important people in your life. On this special day, you should be able to enjoy your special celebration with a clear mind and a clear house. That’s why we suggest taking the time before the big day to clean up and clear out. Enjoying the holiday should be about sharing sweet moments with your loved one — and feeling the satisfaction of a clean home can just make it seem all the more romantic! 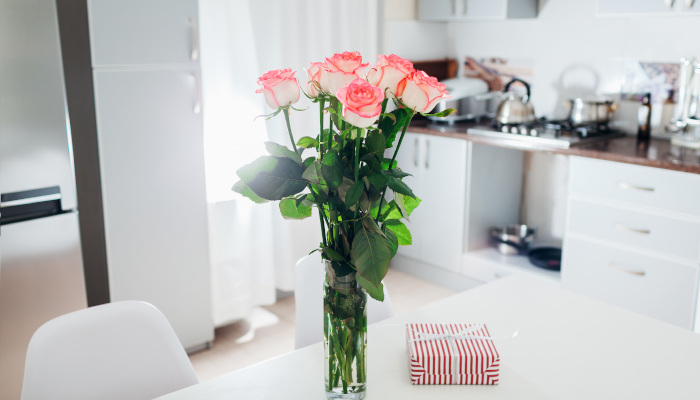 Here are a few simple, effective ways to make sure your Valentine’s Day is not only filled with great times and lots of love, but also comes off clean, fresh, and completely uncluttered. What could be more romantic than that? Who wants to share a special Valentine’s Day meal staring out over a pile of dusty clutter? Before the big day, take some time to unload things you no longer need, and organize wherever you can. Not only will you feel relief from all this decluttering, it will take a major weight off your loved one’s shoulders, too. As the same time, you can make tidying up a fun process you can enjoy together. Going over your home room by room can be a bonding activity. You may find ways to organize your space together and get rid of items that no longer spark joy — and, by extension, find more joy as a pair. A truly romantic move? Skip the dinner reservations and cook a meal for your special someone — or better yet, share a delightful cooking experience together. To prepare, slap on some rubber gloves and put some elbow grease into that stovetop. Most of us use this cooking surface all the time, so odds are it could use a good scrubbing. It may be a chore to get started, but as you throw together a delicious meal in a clean space, you’ll be glad you did. Bonus points if you get the nasty smell out of your trash can and clean your fridge, too. Sweeping the space up for Valentine’s Day — it’s an absolute must, especially if you have kids and pets! Definitely take the time to get up all the dust bunnies before your loved ones come to call. And to really make the space shine, mop up using your favorite fresh-smelling, green cleaner on the big day. This way, anyone who comes over will be impressed by the clean smell and fresh look of your space — and not see the dust and scuff marks that may have been lingering there before. What’s the most thoughtful thing you could do for your partner? We can think of one thing — cleaning the bathroom, so they don’t have to! Nobody likes to clean up the bathroom, so what could be a better gesture for your loved one than scrubbing the shower, cleaning the toilet, and freshening up the mirror and countertops? Prepare for a big hug for this surprise — especially if you get the “hard to reach” areas, like the space behind the toilet or the back of the vanity. Cleaning the floors and surfaces and nooks and crannies — all of these tasks are definitely necessary for a totally fresh Valentine’s Day. The chocolate-covered strawberry on top of it all? Give your home a sweet-smelling boost! Whether you love candles or essential oils, adding a nice smell to your space can make everything feel even more refreshed and inviting. Plus, candles are a great way to add some romantic ambience to your Valentine’s Day celebrations. Busy around the holiday? Just want to spend some much-needed time alone with your loved ones? Even if you’ve developed a regular cleaning routine that works for you, additional help from a professional is always a good idea, especially around these busy, active holidays. Here at SDCS, we always make a sweeping effort to make life less stressful! We’re here to help you get your space ready for those special occasions where you want everything to look its absolute best. Our teams of professionally trained cleaners offer flexible time windows, and can bring all of the tools and products necessary to clean your home, with an emphasis on green, environmentally friendly materials. Have any more questions? Ready to get started making this special holiday even sweeter? Drop us a line today for your free cleaning estimate. Want to share your favorite Valentine’s Day cleaning tips? We’d love to hear from you! Become part of our cleaning community over on Facebook!